Cassey Ho’s net worth now ranks her among the world’s “dot com” millionaires – a milestone she reached before her 30th birthday. Her revolutionary POP Pilates – a combination of her own design that blends pop music with Pilates – and her wildly popular fitness YouTube channel, Blogilates, launched her into internet start-up stardom. Since its inception, Blogilates now has 3.4 million subscribers with hundreds of millions of views on her videos. Cassey Ho told Forbes that she derives a large portion of her livelihood from her YouTube channel and website, and her net worth is rumored to be $2 million. How Did Cassey Ho’s Net Worth Grow? Cassey Ho’s very first workout video wasn’t for a future business venture. She wanted to give her students something that would help them continue to work out, even when she wasn’t present. She called it “POP Pilates: Total Body Sculpt.” Not long after it went live, questions began to pour in for more videos, especially focusing on targeted areas of the body. Her current job as a fashion buyer lost all its luster, and she quit to pursue her fitness platform full-time. By 2014, Blogilates had a solid following of 1.2 million subscribers and Ho was earning a full income from it. YouTube views – The primary income generator for YouTubers is ad revenue. Typically, revenue is calculated per 1000 views and per the agreed upon price. 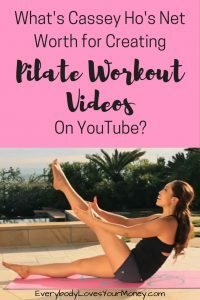 Subscribers to Blogilates also have the potential of making future purchases per Ho’s recommendation or spreading the word on social media to grow her following on other networks. Website traffic – Ad revenue is a primary resource on Ho’s website, as well as her promoted products. Adding a shop to her site allows fans of her workout videos and apparel to browse her choice of products and buy them directly from her site. Selling her own products – With her fashion background, Ho tapped into her love for finding a great look with her passion for fitness. Her apparel is priced high due to the weight her brand carries. Just like you can buy signature decor from Chip & Joanna Gaines of Fixer Upper – though you’ll likely pay more – you can have a Blogilates look for the right price. In conclusion, Cassey Ho took her passion into an oversaturated market and brought something new and exciting to the table. Through her platform, she has published a book, has been featured on Dr. Oz and Shape Magazine, and continues to grow a larger following of passionate, fitness-oriented fans every month. After watching Ho establish herself as a successful and wealthy business women, it will be no surprise to see her net worth continue to climb. To find out more about how entrepreneurs and celebrities built their wealth, click here. Does Cassey Ho’s net worth surprise you? Would you ever launch a business on YouTube? Tell us in the comments below! I’ve been seeing this exact same post on at least three personal finance blogs thus far (“Cassey Ho’s Net Worth”). Personally, I think it’s a little tacky that she’s turning to affiliate marketing to spam her name across the PF community. Hi, Maxi! It’s entirely possible that she’s reaching out to blogs to promote her business, but we just wanted to create an informational post for our readers and are in no way affiliated with her. We’ll always disclose our affiliate links within the body of the post when they’re present.